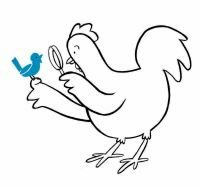 Biosecurity is taking measures to protect your birds from harmful biological agents, like viruses, bacteria, parasites, etc. In commercial poultry production, this generally means total confinement operations with strict rules to maintain flock health such as shower-in and out systems, special clothing, disinfection, and other measures. In small production or “backyard” poultry operations these measures aren’t always a reality. 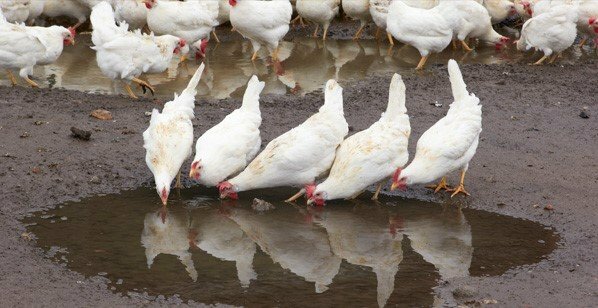 However, there are steps that should be taken to help promote biosecurity and safety for small production flocks. Please keep in mind, biosecurity is the cheapest and most effective means of disease control available! No single disease prevention program will be effective without taking proper biosecurity measures. Biosecurity is a proven method that can help to promote the health of your flock. Isolation refers to the confinement of animals within a controlled environment. A poultry house will keep your birds in, but it also keeps unwanted visitors out. If your birds have outdoor access, it is also important that you use fencing that can guarantee the aforementioned. Isolation also applies to the practice of isolating your sick birds from the healthy birds to prevent further spreading of disease. Don’t forget to separate your birds by age groups. In many poultry operations, all-in/all-out management is applied, which allow simultaneous depopulation of facilities between flocks. It allows time for periodic clean-up and disinfection, which is often neglected. Traffic control is not only about the supply of birds and goods, but also about the visits of people to your farm and the traffic patterns within the farm. Sanitation addresses the cleaning and disinfection materials, equipment and people entering the farm, and the “clean” way of working on the farm. Restrict access to your farm and flocks. Your birds are healthy and it’s important to keep out disease from the outside surrounding. Limit the number of people that come in contact with your birds, especially if your visitors have birds themselves. All visitors should always sanitize their hands and clean their shoes properly. We strongly advise you to provide them with clean company shoes and clothes before visiting your birds. Limit any possible contact with wild birds as they can carry disease. This is especially true for migratory waterfowl. When your birds have outdoor access, keep them in a screened area that prevents them from any contact with wild birds. Keep predators and rodents out! Enclose your flock properly and consider closing your facilities during the nighttime. Make sure that your birds are securely fenced in. Bury your fencing deep enough to ensure that predators like foxes, badgers and coyotes don’t get in and your birds don’t get out! Have a proper rodent and pest control scheme in place, monitor your traps daily. Provide proper nighttime housing, with proper ventilation. It should be attractive for the birds to spend the night. Effective biosecurity and cleanliness go hand in hand. Parasitic, bacterial and viral diseases can stay around for weeks or even months in dirty environments. Always keep your feed and water clean! Keep an eye on your bedding. Birds are often consuming things off the ground, which could result in ingesting harmful parasites, bacteria or viruses that may have come from an infected bird. Always remove wet bedding and replace it with fresh dry bedding. This also includes when bedding smells bad, is damp or has become dirty. Clean and disinfect thoroughly between batches of birds, replace all the bedding. Certain diseases can survive for a long period of time in the bedding, examples are Marek’s disease and the Avian Influenza virus. Regular cleaning helps you to prevent the spread of diseases. Thoroughly clean and scrub objects before applying disinfectant. Disinfectants are not effective if they are applied over caked on dirt, manure, or bedding. Apply disinfectants using brushes, sponges, or spray units. Allow adequate contact time. Dispose of used disinfectant properly. Vehicles, clothing and other equipment can all carry disease. When you or your farm workers have been in contact with other birds, ensure that any items that could have been in contact with those birds are cleaned thoroughly. Footwear (shoes, boots, clogs) can be a major source of transferring disease. 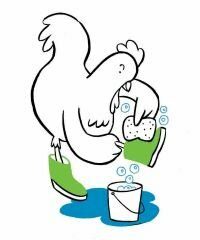 Make sure that you always wash and disinfect your shoes before coming in contact with poultry. We highly recommend to always have a special set of shoes when taking care of your own poultry, and even better would be to have a special set for every poultry house. After visiting another farm, make sure that you always take a shower and change all your clothes before visiting your own birds again. Be sure to always clean and sanitize your hands after cleaning your shoes and before entering your barn. When bringing in new birds into an existing flock, isolate them first, to check if they haven’t picked up any new disease. Try to prevent mixing species. Especially turkeys are rather susceptible to chicken diseases. Try to limit the number of visitors that come in contact with your birds, especially if your visitors have birds themselves. If there is still a need for them to visit your birds, explain your biosecurity rules to them and explain why biosecurity is of importance to you. All visitors should always sanitize their hands and clean their shoes properly. We strongly advise you to provide them with clean company shoes and clothes before visiting your birds. Try to limit exchanges in equipment, tools or supplies with other farmers. As diseases can be easily spread by sharing. When sharing is necessary, make sure to clean and disinfect before and after it reaches another property. Never share items that cannot be properly cleaned, such as wooden pallets, fresh litter and cardboard egg cartons. Place the mat into the bottom of the bin. Mix the disinfectant with the appropriate amount of water, pour enough disinfectant into the bin that the bottom of the mat is wet, but not enough disinfectant that peoples’ feet will get wet. Ask any visitors to walk through the footbath and wipe their feet on the mat. The mat will scrub their shoes and apply disinfectant. When the liquid starts to get dirty, empty it and replenish with new disinfectant. It is advisable to do this regularly, depending on your disinfectant and the number of visitors that go through it. We advise you to do replenish the disinfectant at least once per week. If you notice any of these symptoms, contact your poultry veterinarian. If the number of sick birds in your flock is limited, try to isolate the sick bird from the healthy flock as good as possible to prevent further spread of the disease. Biosecurity is an important part of keeping your flocks safe and healthy. An effective biosecurity program will have its positive impact on the economic performance of your flock. As mentioned above, simple measures can be taken to promote biosecurity at your farm. 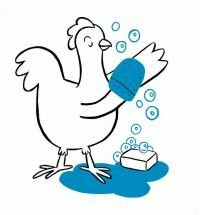 By cleaning carefully and regularly, limiting contact from visitors, and being careful not to bring disease home, all poultry producers can increase the health of their flock and decrease the chance of disease. 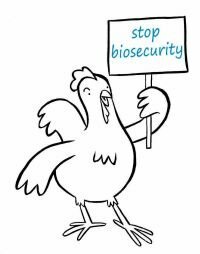 Biosecurity is crucial to the success of any operation, please contact your local HG representative to find out how we can help you to bring the biosecurity at your farm to the next level!